[prMac.com] Virginia Beach, Virginia - Jolly Books, LLC, an independent publishing company, today is proud to announce the release of True Heroes 1781 (v1.0), their first game in a series of history mystery apps. True Heroes 1781 is an educational app for elementary to middle school aged children and is loaded with historical fun. 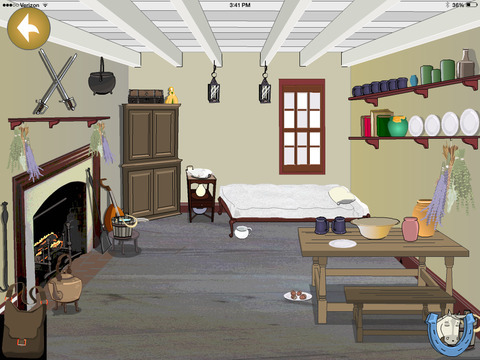 The app teaches kids about George Washington, life in colonial times and the birth of America. It features games, videos and more than a dozen historical facts. Blue Skin, George Washington's favorite horse, and the Villagers will guide kids through a virtual Colonial Village. While kids search through the village for items needed to complete a day in the life of a colonist, they will interact with exciting characters, play games and learn dozens of historical facts about George Washington and the birth of our nation while discovering that they too, are True Heroes. There are almost no history focused history apps, and Jolly Books hopes to fill this void. True Heroes:1609 featuring Pocahontas and Jamestown is already in the works. Jolly Books is excited to create educational media to teach children about the world, how to lead and live with purpose. Jolly Books, Growing Leaders. True Heroes 1781 (v1.0) is $2.99 USD (or equivalent amount in other currencies) and available worldwide exclusively through the App Store in the Education category. Based in Virginia Beach, Virginia, Jolly Books is an independent publishing company, and brain-child of creative husband and wife team, Dustin and Maylissa Luby. The company creates educational media to teach children about the world, and how to live with purpose. All Material and Software (C) Copyright 2015 Jolly Books, LLC. All Rights Reserved. Apple, the Apple logo, iPhone, iPod and iPad are registered trademarks of Apple Inc. in the U.S. and/or other countries. Other trademarks and registered trademarks may be the property of their respective owners.